First, copy the URL (the web address that appears at the very top of the page) address of the page you would like to link to. Next, open the Page or Post where you would like to create the link. Highlight the text that you would like to make a link. 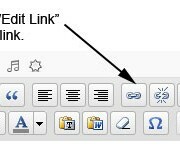 Then, select the “Insert/Edit Link” icon in the toolbar at the top of the Visual Editor (pictured left). The Insert/Edit Link box will open. In the Insert/Edit Link box, paste the document’s URL that you copied earlier into the “Link URL” field (pictured right). In the Target field, select either “Open link in the same window” or “Open link in a new window”. If you choose the latter, your document will open in a new browser window. Then click on “Insert” to finish creating your link. The text you highlighted should now be underlined and a different colour. Select “Update” to save your changes. 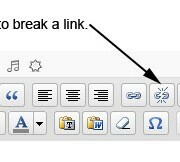 To break a link, highlight the linked text and select the “Unlink” icon in the toolbar above the Visual Editor (pictured right). * Note: click on images to expand them.